Earn 10,000 bonus points after $500 in purchases, redeemable for $100 cash back statement credit. 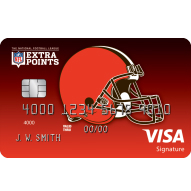 Earn 2 points per $1 spent on NFL or team purchases in-stadium and 1 point per $1 on all other purchases. Redeem points for game tickets or cash back statement credits on travel or any other purchase of $25 or more. 20% off every purchase at NFLShop.com - that's $20 off every $100 you spend. Variable APR, currently 14.99%,19.99% or 24.99%, based on your creditworthiness.